Musical Director of the City of Launceston Philharmonic Orchestra, Stephen King, is also the Musical Director of the University of Tasmania Wind Orchestra, only the second person to hold this position in the Wind Orchestra’s 20 year history. He has been involved with University of Tasmania Community Music Programme since 1990 when he joined as a trombonist. Since that time he has held numerous musical positions, including Principal Bass Trombone and Principal Trombone of the Wind Orchestra, Musical Director of the Symphonic Band and Concert Band. For many years he served as the Executive Officer and Administrator for University of Tasmania Community Music Programme. During the week Steve is Director of Bands at Scotch Oakburn College in Launceston and he also lectures in Music Education at the University of Tasmania. 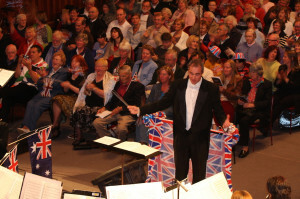 He has appeared as a guest conductor, adjudicator and soloist throughout Tasmania, Victoria, Queensland and New Zealand. In December 2006 Steve visited Northwestern College, Minnesota US where he undertook further study in conducting, brass pedagogy and music education. As bass trombonist he regularly performs with the Ross Challender Big Band and has performed as a member of the Tasmanian Big Band and backed artists including Shirley Bassey. He has appeared on recordings as both conductor and performer. He holds Bachelor Applied Computing, Bachelor of Performing Arts (Music), Bachelor Teacher (Hons), Master of Education (Research) from the University of Tasmania.